Anne Lawton, RN, community liaison for St. Peter’s Hospital Cancer Care Center, left, with Rumors Salon and Spa founders Marri Aviza and Lisa Norgrove. A new program will enable patients at St. Peter’s Hospital Cancer Care Center to enjoy free salon, beauty, and other services at Rumors Salon and Spa in Latham, New York. The new program, called “Tuesdays with Rumors,” was announced September 16 at a celebration to commemorate Rumors’ 30-year anniversary. 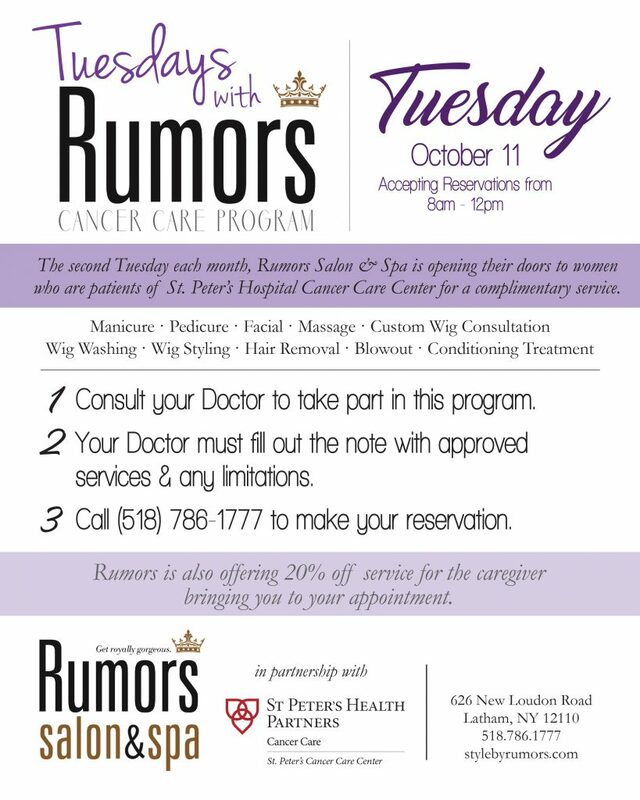 Beginning in October, Rumors will open their salon and spa on the second Tuesday of every month to women who are patients of St. Peter’s Hospital Cancer Care Center. Complimentary services to be offered include: hair removal, manicure, pedicure, mini facial, mini massage, wig fitting, wig washing, wig styling, blowout blow-dry, and conditioning treatment. “We are so pleased to partner with Rumors Spa and Salon on this program, and so thankful to them for the generosity, compassion, and comfort they are offering to our patients who are battling cancer,” said Virginia Golden, chief executive officer of St. Peter’s Hospital and Albany Memorial Hospital. Rumors partners Marri Aviza and Lisa Norgrove founded Rumors Salon and Spa in 1986 with a team of four and a single goal: “We want you to feel royally gorgeous, from the inside out.” Today, the Rumors team is comprised of 104 internationally trained professionals. “The ‘Tuesdays with Rumors’ program will have a very special meaning to me,” Aviza said. “Being a veteran of breast cancer, I was inspired to start this program because not all women have access to beauty services to help them look better and feel better. In doing this program, we believe that we will help the outlook of these special ladies on their diagnosis and brighten their moods. I know how these women feel and being able to provide them a day of peace and pampering is truly beyond words. “My business partner, Lisa Norgrove, and I are committed to this community and we love that we are able to help women in this very special way,” Aviza said. 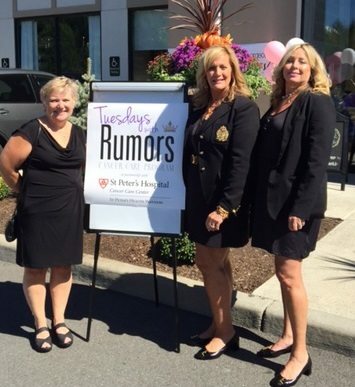 Women who are patients at St. Peter’s Hospital Cancer Care Center and wish to participate in “Tuesdays at Rumors” should consult their physician, who must fill out a doctor’s note specifying approved services and any limitations. With the note in-hand, patients can then call Rumors at 518-786-1777 to make a reservation. In addition to complimentary service for St. Peter’s Hospital Cancer Care Center patients, Rumors is giving accompanying patient caregivers a 20-percent discount off a salon or spa service.